Adverts on Yahoo's homepage were infected with malware designed to mine the Bitcoin virtual currency, according to security experts. "The malware writers put a lot of effort into making it as efficient as possible to utilise the computing power in the best way," Light Cyber's founder Giora Engel told the BBC. "Generating bitcoins is basically guessing numbers," said Amichai Shulman, chief technology office of security firm Imperva. "The first one to guess the right number gets 25 bitcoins and if you have a large volume of computers guessing in a co-ordinated way then you have a more efficient way of making money," he added. Other than a computer running slower, victims will be unaware that their machine is being used in what could become known as a "bitnet". It is a variation on the traditional botnet, networks of malware-infected computers used to churn out spam or bombard websites with requests in order to knock them offline. Since bitcoins have risen in value - at its peak one bitcoin was worth $1,000 - making it a lucrative market for online criminals. 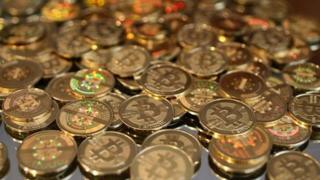 "Bitcoin mining malware is the new frontier as criminal gangs look for new ways to make money," said Mr Engel. "From December 31 to January 3 on our European sites, we served some advertisements that did not meet our editorial guidelines - specifically, they spread malware," the statement read. It went on to say that users in America, Asia and Latin America weren't affected but did not specify how many European users were victims. Fox IT, the Dutch cybersecurity firm which revealed the malware attack, estimates that there were around 27,000 infections every hour the malware was live on the site. Over the period of the attack that could mean as many as two million machines were infected. Such attacks may be hard to avoid, said Mr Shulman. "For an ad platform it is virtually impossible to guarantee 100% malware free ads." "There are many independent stakeholders involved in the process of web advertising, so from time to time any ad platform is bound to deliver malware."